Silicon Valley activists this week joined a nationwide campaign protesting a Trump administration proposal to narrow the definition of gender and roll back civil rights protections for trans and gender-nonconforming people. San Jose’s rally was one of hundreds of similar events held throughout the country in response to an unreleased memo from the U.S. Department of Health and Human Services that aims to redefine gender under Title IX—a federal law that bans gender discrimination in publicly funded education and healthcare programs—as immutable, binary and based on a person’s genitalia at birth. Within hours of the New York Times breaking news of the memo Oct. 21, the hashtag #WontBeErased began circulating on social media. Vigils and protests took place in New York City that same evening and spread from state to state in the ensuing days. Santa Clara County on Thursday issued a statement condemning the proposed policy change, saying it would undermine the rights of transgender and non-binary people in educational settings and effectively promote discrimination. 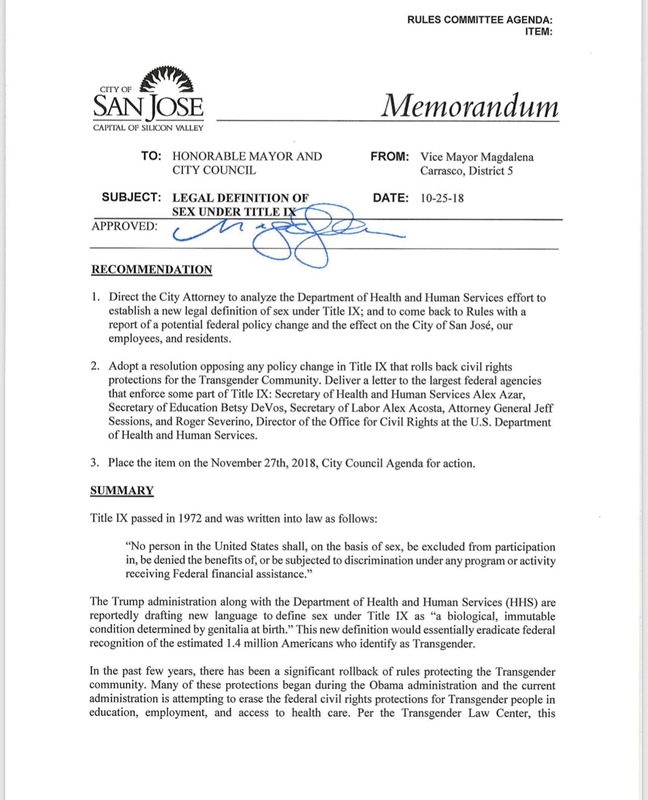 San Jose Vice Mayor Magdalena Carrasco introduced a memo of her own asking city staff to study the pending Title IX change and come back with a report on its impact at an upcoming Rules and Open Government Committee meeting. She also recommends adopting a resolution opposing any federal policy change that limits the rights of the 1.4 million Americans who identify as transgender. Sera Fernando, a trans Filipina who emceed Wednesday’s in San Jose, said she’s fortunate to have begun her transition five years ago in a community that supports her and under a presidential administration that began advancing rights for trans folks. But what a contrast, she lamented, to the civil rights rollbacks under Trump. “When you have a government entity saying you don’t see transgender as a form of gender identity, there’s a validation right there for others to totally disregard you as a person, to disregard your pronouns and to, basically, erase your existence,” she said. This past week has taken an emotional toll, Fernando said. Below are some photos by Greg Ramar of San Jose’s #WontBeErased rally. I can’t help thinking they’d get more attention from the rank-and-file if they wore business attire. > Health and Human Services that aims to redefine gender under Title IX . . . as immutable, binary and based on a person’s genitalia at birth. Seems to me to be a science-based definition. Do the LGBTQ people have something against science? Folks, everyone has a right to fair treatment. No sane person disputes that. I believe that people are born either gay or straight the same way people are born right-handed, left-handed or ambidextrous. However, when one’s supposed “sexuality” results in a desire and a deliberate act of self-mutilation, that is a mental illness. I make no condemnation of transgenders, but I cannot be convinced that voluntary, deliberate genital mutilation is anything other than a mental illness. These people should be helped, not enabled. How the “trans” group has tethered itself to the gay community is also beyond my comprehension. The gay community strives to have society recognize the differences between people and that being gay or straight should be as accepted as any other difference among the human population, akin to race color, or creed but mentally healthy gay people also strive to accept themselves as they are. They don’t mutilate themselves and call it a lifestyle. > I make no condemnation of transgenders, but I cannot be convinced that voluntary, deliberate genital mutilation is anything other than a mental illness. These people should be helped, not enabled. Medical experts seem to agree with you. A less circumspect person might actually say that transgender surgery is quackery. I’m never quite sure which of us should be more terrified whenever we agree. However, I wouldn’t necessarily consider transgender surgery to be “quackery” any more than I would consider what Doctor Josef Mengele did to be “research”. And what of the Hippocratic Oath, to wit: “primum non nocere,”or ““first, do no harm”. I was born as a right-handed person but have always felt like a left-handed person. Should I go find a doctor who will cut off my right arm so I can live as the left-handed person I’ve always felt I was meant to be? > However, I wouldn’t necessarily consider transgender surgery to be “quackery” .. .
Any medical practitioner who performs a dangerous, destructive procedure with the knowledge that the procedure is ineffective or worthless is, in my book, a quack. At certain times in relatively recent history, a doctor who performed dangerous destructive surgeries was called a war criminal. Now instead, we call them, what? ; A human rights crusader for the “trans” community? I don’t care what consenting adults do or what lifestyle a person chooses to live but I have to draw the line at self-mutilation. There are animal rights groups that object to carving up live animals for medical research but where is the group that objects to some bizarre-minded doctor who chooses to carve up live humans under some misguided sense of civil rights?! I make no value judgment on their character or worth as human beings but seeing a group of transgenders being “celebrated” gives me the same feeling as watching a small animal spin around with its leg caught in a steel trap. Folks, when someone has a pieced ear, if they don’t leave a post in and keep it dilated, the hole will close. It’s no different after certain “surgeries”. Use your imagination; And that’s just one aspect of the profane aftermath of such mutilation. I feel so sorry for these people. We need to help them, not encourage them. The rate of suicide among ‘transgenders” is ungodly high, despite what the activists will tell you. > The rate of suicide among ‘transgenders” is ungodly high, despite what the activists will tell you. > . . . the 1.4 million Americans who identify as transgender. That’s a lot of suicides. Do you think the “head of transgender services for Santa Clara County’s Office of LGBTQ Affairs” knows? Or, is he otherwise occupied fretting over the federal definition of “gender”?